Would you believe that at one point in Hungary’s history, prices of goods could double in just 15 hours? Or that in 1923 Germany a loaf of bread cost 200 billion marks? Or that Zimbabwe’s former currency has been printed in denominations as high as 100 trillion? These are real-life historical examples of hyperinflation – when a country experiences extremely high and rapidly accelerating rates of inflation. As the video below explains, most economists believe that too much inflation or deflation is bad for an economy, but “a small, consistent amount of inflation is necessary to encourage economic growth.” So while the word inflation has somewhat of a negative connotation, many central banks accept or even aim for just a little bit of inflation (generally 1-3%). Inflation above 3%, however, can be problematic for an economy. Although rare, there have been instances when inflation reached levels astronomically higher than 3%, and entire currencies collapsed. Examples of these instances demonstrate just how detrimental inflation can be to a country’s economy and citizenry. Here are the five most extreme cases of hyperinflation ever recorded. Hungary’s hyperinflation of 1945-46 was the most severe instance of hyperinflation in history. 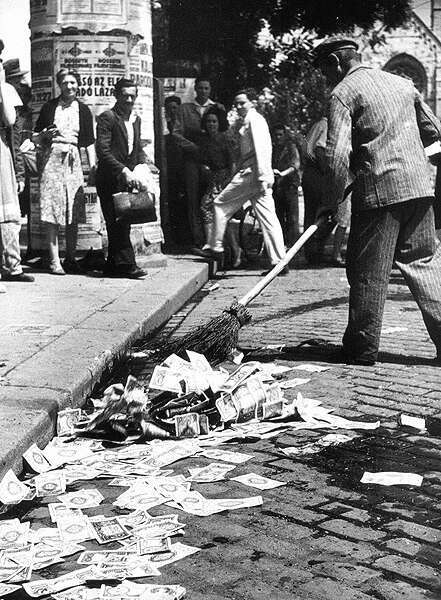 Costs of preparing for World War II led to loose monetary policy and depreciation of the Hungarian pengő currency. At the end of the war the Hungarian government began rampantly printing money. Denominations got so high that milpengő (1 million pengő) and bilpengő (1 billion pengő) denominations were introduced to reduce the number of zeros and make calculations easier. Prices could more than double in just one day. A new currency called the forint was introduced in 1946, and old pengő were littered in the streets. Zimbabwe’s inflation problems began in the early 1990s when a government program to redistribute land from white Zimbabwean landowners to black farmers led to drops in food production and the collapse of the banking sector. President Robert Mugabe’s government also printed money to pay off loans and fund the country’s military involvement in the Democratic Republic of the Congo and the Second Congo War. The money printed was also used to pay higher salaries to army and government officials. In 2006, the New York Times reported that a roll of toilet paper cost 145,750 Zimbabwean dollars or “Zim dollars”. Some Zimbabweans may have actually used Zim dollars as toilet paper – a photo of a sign posted over a public toilet in South Africa reading “TOILET PAPER ONLY – NO ZIM DOLLARS” circulated on the internet at one point. In the late 2000s, Zimbabweans began using foreign currencies instead of Zim dollars, and in 2009 the currency was abandoned completely. To this day, Zimbabwe still uses foreign currencies and has no national currency. After a breakup of the country, a series of regional conflicts, and an embargo by the United Nations, Yugoslavia’s economy crumbled. The central bank attempted to print its way out debt, which spiraled out of control and resulted in hyperinflation. The cost of living multiplied by 6 trillion in less than a year. In effort to remedy the inflation, new dinars were introduced, with the new dinar being equivalent 1,000,000 old dinars. More new dinars were subsequently introduced; in total, the currency was revalued five times. “For a sense of the impact on the local population, imagine the value of your bank accounts in dollars and then move the decimal point 22 places to the left. Then try to buy something,” writes Steve H. Hanke of the CATO Institute. After being defeated in World War I, Germany was required to pay reparations in the form of gold or foreign currency. The Reparations Commission would not accept German Papermarks, or “marks”, which were rapidly depreciating in value due to the German government’s misguided monetary policy to pay for the war. One of Germany’s strategies was to print mass amounts of marks and then buy foreign currency with them. 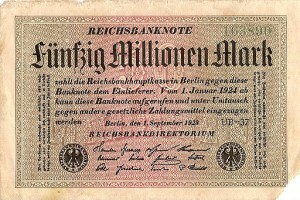 In August 1921, hyperinflation set in as Germany began purchasing foreign currency for any amount of marks. The exchange rate continued to fall, meaning more and more Marks were required to buy the foreign currency, and in turn more and more marks were printed. At one point there were so many marks in circulation that they had to carried in large sacks or even wheelbarrows. As one story goes, a man left his wheelbarrow full of marks outside and later saw that the wheelbarrow had been stolen but the marks remained. World War II put Greece into tremendous debt (are you seeing a pattern here?). When Greece was invaded and occupied by the Axis powers, the country suddenly had to support 400,000 Axis soldiers and owed the powers a huge indemnity. In addition, national income in Greece fell drastically and tax revenues slid. 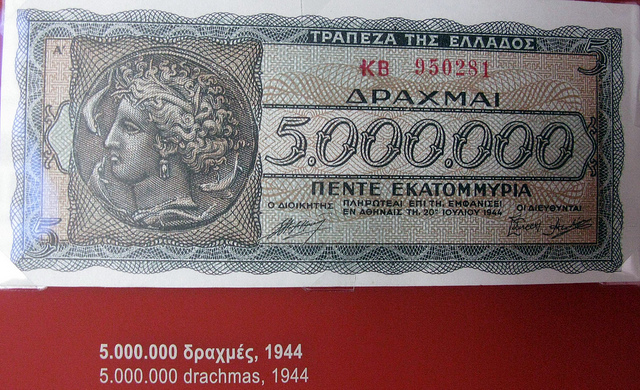 The Greek central bank printed its drachma currency to cover these costs and pay off its debt, and by 1943 hyperinflation had set in. 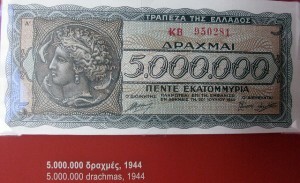 By 1944, citizens only held onto their drachma for an average of four hours before spending it, compared to 40 days in 1938. As these cases demonstrate, fiat or “paper” currencies are not finite. Without a gold standard in place, they can be printed by governments with nothing backing them and quickly lose value. Gold, on the other hand, is finite, has intrinsic value, and cannot be printed. Therefore, it is no wonder that when governments announce money creation programs such as quantitative easing – as the United States did in 2008 and Europe did on Thursday – investors often quickly turn to gold as a hedge against potential inflation. For instance, after Thursday’s announcement that the European Central Bank is implementing quantitative easing, gold rebounded to a 5-month high. The euro also dropped to an 11-year low against the dollar on that same day. With Europe now buying 60 billion euros worth of assets per month through September 2016 – a program whose effects could be felt beyond Europe – it may be time to begin protecting and diversifying your investments with physical gold. Call American Bullion today at 1-800-326-9598 to purchase gold or silver coins and bars for secure delivery to your address, or even add gold to your IRA or former 401(k). You may also request a Free Gold Guide by submitting the form at the top of this page. Invest in something real!